Banos de Agua Santa (translated “Baths of Sacred Water”) is known as the adventure capital of Ecuador. 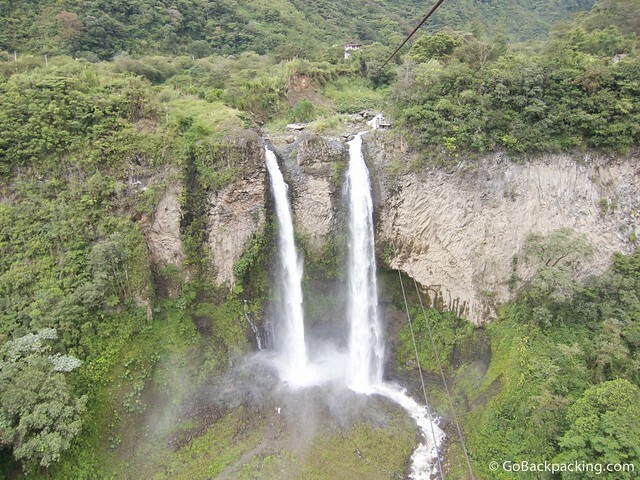 Situated in a valley, at the base of the active Tungurahua Volcano (5,023 meters), there are enough affordable activities to keep any adrenaline junky happy. 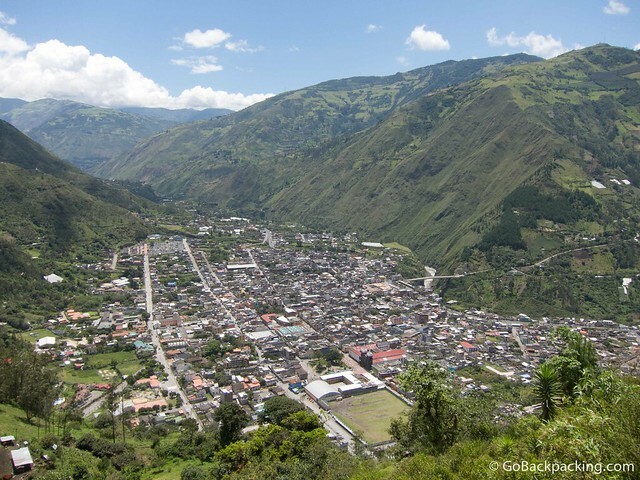 Compared to the big cities in Ecuador, Banos is relatively safe. However petty crime still occurs as thieves target tourists. During the day, you can use your camera or smartphone openly, however, take extra care when walking around at night. As a rule of thumb, don't carry anything you're not prepared to lose. On the weekends, the pueblo swells with vacationing Ecuadorians. Whether you're just grabbing lunch, working your way through whitewater rapids, or getting a beer at the local discoteca, chances are you'll be rubbing elbows with them. Read more of our Banos travel guide to find out the best places to hang out. 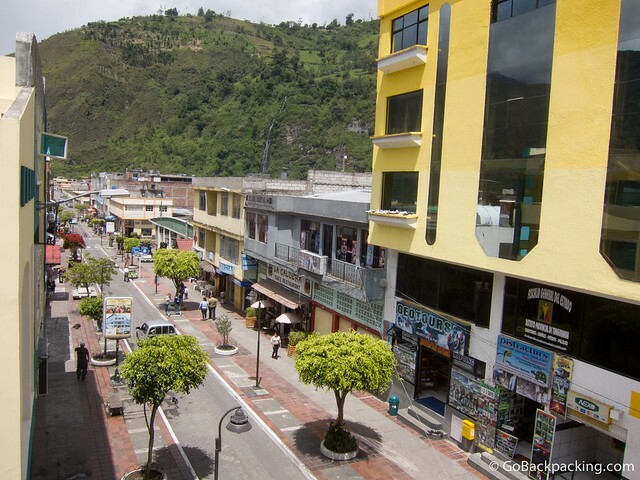 Banos' small bus station is located three short blocks from the city's main square. It's an easy, flat walk, so there's no need to take a taxi. If you do need a taxi, it shouldn't cost more than $1 to go anywhere in the town. The bus station features a handful of company offices, all of which have scheduled departure times and destinations indicated on the windows. Don't depend on any given company representative to provide you with accurate information about what's available from other companies. For example, when I went to buy a bus ticket to Guayaquil, I asked about morning departures. The first two reps indicated none were available. However, the last office in the station offered a 9 AM bus. Banos is small enough that you can go anywhere in the pueblo by foot, and could walk the whole length of town in 30 minutes. Mountain bike rentals are available from almost every travel office and offer riders the opportunity to explore the region beyond the pueblo limits. You'll see them parked on the streets outside adventure tour companies throughout Banos. While a more expensive option for getting around the region, you'll see men and women of all ages having fun driving these vehicles. Taxis are an inexpensive option if you want to head up the mountains for scenic views of the volcano and Banos, without having to hike or bicycle. The taxi queue is next to the bus station. Taxis are unmetered, so get an estimate from a local before entering a negotiation. Local buses are useful if you want to visit the outer edges of Banos. The average price is about $0.25 per ride. Also, you can use them to visit neighboring cities, such as Puyo. Either buy a ticket at the bus station, or flag one down on the main street in front of the station. There are tons of hostels located throughout central Banos, so you should have no trouble finding a place to stay for the night. To ensure a room of your choice on the busier weekends, either book in advance, or arrive before Friday. Erupcion Hostel (Editor's Pick) – Corner of Thomas Halflants and Ambato. Family run hostel with an excellent location three blocks from the bus station, along the main road. Strong Wi-Fi signal in rooms and large breakfast included daily (bread, cheese, eggs, fresh juice, coffee). Private room w/bath and cable TV is $10. Los Pinos Backpackers – Ricardo Zurita Carrillo y Ambato. One of the highest ranked hostels on Hostelworld, Los Pinos caters to foreign backpackers, providing common areas and typical stuff like a pool table and salsa lessons. Dorms are $8; privates are $24. La Casa Verde Eco Hostel – El Camino Real, Santa Ana. 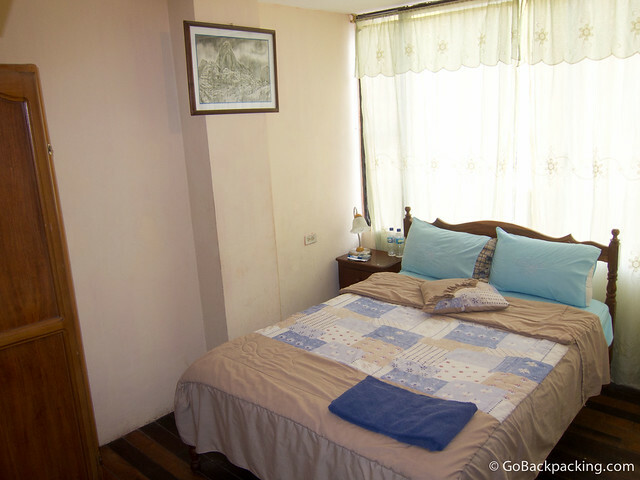 Located on the outskirts of Banos on a small farm, this hostel is a step removed from the business of downtown Banos. Private room w/bath is $19. Luna Runtun Adventure Spa – Caserio Runtun Km 6. If you're looking for the best hotel in Banos, and have the money to spend, Luna Runtun's hotel tops the list. Perched on a precipice hundreds of meters above Banos, these hotel and spa facilities offer sweeping views of the entire valley. Rooms and suites run $100+ per night. To enjoy the view, without the hefty price tag, take a taxi up ($6) for a coffee at Cafe del Cielo, or a meal at their restaurant. If you plan to spend a few weeks, or months, in the city, then you'll want to rent a room or apartment. Your best bet is to either negotiate a long-term rate with a hostel or ask around for apartments for rent. There's a small Couchsurfing community in Banos. In addition to Banos' natural setting at the base of an active volcano, it's within easy walking, biking, or driving distance to a wide array of waterfalls and rivers. And because of Ecuador's small size, tour companies from Banos also operate biking and climbing trips to Cotopaxi Volcano, in case you missed it during your time in Quito. Hot Springs (Termales) – There are two hot springs to choose from. The hot springs at the base of Cascada de la Virgen are only a 5-minute walk from the center of town. The waterfall is easy to see, so just walk toward it. Entrance is $2, towel rental $1. These are open day and night and can get very crowded. Avoid them on the weekends. El Salado is newer hot springs, located a few kilometers from central Banos. It's worth a bicycle or taxi ride to get there (maps aren't drawn to scale). These pools are situated alongside a creek and are only open during the day. Locals say the best time to visit is 5 AM when you'll have them to yourself. Waterfall Tour (Ruta de las Cascadas) – Within a 20-minute drive of Banos are dozens of waterfalls, with some of the biggest easily visible from the road. There are numerous ways to visit them, from bicycling at your own pace, to renting an ATV, to taking a double-decker chiva for just $6. Some of the waterfalls offer you the chance to take a ride across the canyon on a metal cable car ($1) for a closer look. The most impressive waterfall, Pailon de Diablo, affords visitors the chance to hike ($1) right up to the falls and climb underneath them (if you're willing to get wet). Scenic Views of Tungurahua Volcano & Banos – There are a few popular spots to get a good look at Tungurahua and Banos from above. The first is the Antennas, which are the antennas perched atop mountains above Banos. This is the best spot for viewing Tungurahua from a distance, and a roundtrip taxi will cost you $15. The other option is to take a cab up to the Casa de Arbol (treehouse) which is perched on the edge of a valley that runs down the side of the volcano. A roundtrip taxi here is also $15. Massage & Spa Treatments – There are many spas in central Banos that offer a wide range of services, including regular massages ($20/hour) and hot stone massages ($25/hour). However, manicures & pedicures seem overpriced at $10 each. Bridge Jumping/Swinging – There are two nearby bridges that offer visitors the opportunity to jump off, and swing like a pendulum. The higher bridge jump is $20. Whitewater Rafting – Full and half day rafting trips are offered on the Pastaza River. The class of rapids available may vary based on water levels. Talk to tour operators to find out what you can expect. Typical rapids range from Class II-IV. However, it's possible Class V's might be available. Half day trips run $30. Canyoning (Editor's Pick) – Jump into Rio Blanco with an experienced guide for a series of 4 waterfall abseils in quick succession: 8, 12, 30, and 35 meters. The first two are more technical, while the third and fourth are vertical cliffs, and therefore easier to get down. Half day trips w/lunch are $30. Paragliding (Parapente) – Take to the sky like a bird with an affordable tandem paraglide. Climb Tungurahua Volcano – Climbing this 5,023-meter active volcano is usually done over two days, with a night being spent at the Refuge (Base Camp) at 3,400 meters. Alternatively, you can make it a DIY trip and simply hike to the Refuge. Mountain Biking Chimborazo Volcano – Like mountain biking Cotopaxi, you can drive up Chimborazo (6,267 meters), Ecuador's highest volcano, and bike back down. Monkey Reservation in Puyo – About an hour by bus from Banos, and 15 minutes further by taxi, you can play with monkeys. Cuy (Guinea Pig) is readily available. Banos is an excellent place to dive into the cuisine of the Sierra regions of Ecuador. However, it does require an adventurous spirit (or should I say stomach). 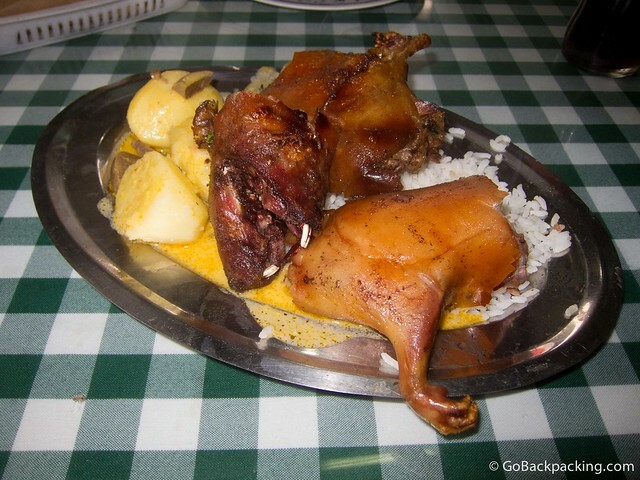 Cuy (Guinea Pig) – Ecuadorians from all over the country enjoy cuy, which tastes like chicken, and is notoriously difficult to eat. Be prepared to eat with your hands and get a little messy, and expect a lot of work for little reward. Llapingachos – Popular dish consisting of fried mashed potatoes (called tortillas), chorizo, a fried egg, avocado, and salad. Yaguarlocro – Tripe soup with avocado, onion, and dried blood. Librillo – Tripe served with rice, and a variety of other sides, including a fried egg or chorizo. Sugar Cane Taffy (Melcocha) – Banos is well known for its super sweet taffy. Throughout town, you'll see people stretching the taffy on wooden pegs in the doorways of the candy shops. A small bag of taffy is $1 and makes a great gift. Sugar Cane Juice (Jugo de Cana) – Banos is also known for sugar cane. Order the juice, or try buying a stalk and sucking it right out as the locals do. You'll see sugar cane being chopped up and bundled for sale all around town. La Cascada Cerveceria (Editor's Pick) – Rocafuerte y Maldonado (corner of central park). Microbrew pub that serves up excellent food thanks to their American chef, Jason. 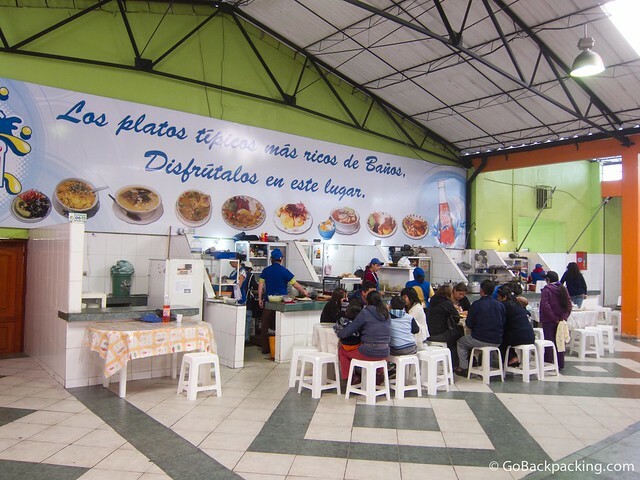 Mercado (Editor's Pick) – Ambato Street. Open until 6 pm daily. The best place to sample regional cuisines like Llapingachos for local prices ($2). Seating is family style; a fun way to dine with the locals. Cuy Shops – Ambato Street (next to the Mercado). Two small restaurants specializing in cuy are located right next to the Mercado. Just look for three guinea pigs skewered on a giant 3-pronged stick and roasting over an open fire. An entire pig is $17, while half of one is $8.50 (including the head), and a single portion is about $3.50. Blah Blah – Halflants near Ambato. Vegetarian food. Casa Hood – Martinez & Eloy Alfaro (facing the central park). Popular, funky restaurant that serves up a variety of ethnic cuisines. Be warned; the pad thai is more like a stir-fry than the traditional dish. For a small pueblo, Banos rocks on the weekends. The party atmosphere is fueled by all the vacationing Ecuadorians. The 3-block Zona Rosa with all the bars and discotecas has a sign pointing to it from Ambato Street. In the evenings, just follow the loud salsa or reggaeton music to its source. 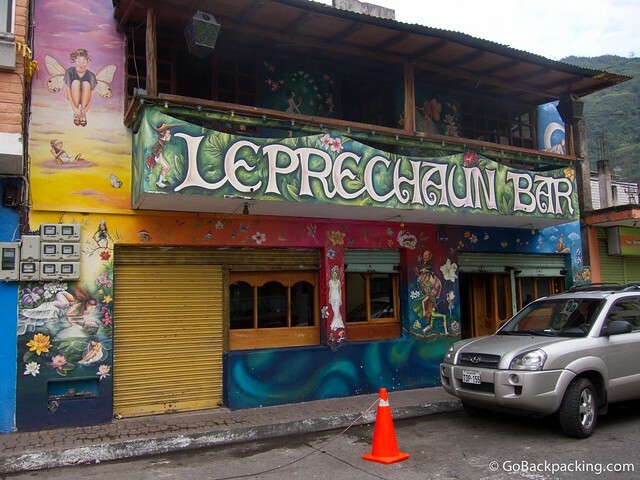 Leprechaun Bar – Alfaro entre Oriente y Espejo. The most famous bar in Banos is Ecuadorian-owned and features a large fire pit in the back which creates a unique, outdoorsy atmosphere.